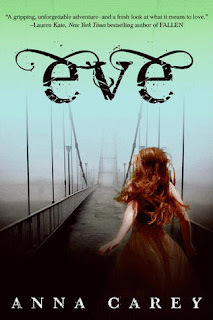 I recently had the opportunity to interview author of Eve, Anna Carey. As you all know Wanda and I both loved Eve and we just LOVE spreading the word about it. 1. How long did it take you to write Eve? The whole process took about nine months (which feels perfectly metaphorical). I'd been thinking about the story for a long time before I wrote anything. I spent two weeks or so outlining, then two and a half months on the first draft. The majority of the work was in revisions. 2. Did you know you wanted to write a dystopian story, or did it just end up that way? When I started Eve I was more interested in writing a post-apocalyptic story. I wanted to write about what happens to people after a horrific tragedy. If a disaster happened tomorrow, how would the survivors more forward? Would we descend into chaos? Would we stay true to the values our country was founded on or follow the first leader with a clear vision? 3. With all the dystopian novels out today, and coming out soon, what do you think makes Eve stand out from the rest? Eve takes place in the near future. The plague strikes in 2021, and the story begins sixteen years after that. It's not a book about some strange, futuristic world with completely new rules. It's a story about our world, people just like you or me, rebuilding in the wake of an unfathomable disaster. 4. What was the most challenging part of creating your characters? Eve has spent the majority of her life inside a government School. She's been taught that men are violent and dangerous, and that going beyond the compound walls means certain death. That makes for great drama once she escapes. 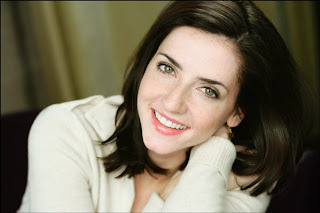 Soon she meets Caleb and learns that everything she learned was wrong. She's confused, curious, and still not entirely sure of Caleb's intentions. Though I worked on other characters in revisions as well, those chapters when she is slowly letting go of all she's been taught were the most challenging. In the second book Eve is taken to the City of Sand--a restored city in the middle of the desert. There she learns her surprising role in the New America. She falls in love (though with who, I can't say) and a greater plan is set in motion. 6. Can you share a small teaser with our followers? This is brief excerpt from Once, the second book in the Eve trilogy, out July 2012. This is the moment when Eve first meets the King. I stepped away from the wall, my hands dropping to my sides. He wore a deep blue suit and a silk tie, the New American crest embroidered on his lapel. He stalked forward, taking one slow lap around me, his eyes scanning my tangled auburn hair, the linen shirt soaked through with sweat, and the scrapes around my wrists from where I'd been bound. The wound on my arm was still open, the blood smeared from my elbow to my hand. When he finally finished his survey, he stood before me, then reached out and stroked my cheek. "My beautiful girl," he said, running his thumb over my brow. Thank you Anna for taking the time to answer my questions and sharing a teaser with everyone. Now I CANNOT WAIT for Once! You can find both, Wanda and My review of Eve HERE. GIVEAWAY: ONE SIGNED copy of EVE to one lucky follower! - Winners will be announced on our Twitter and Facebook account. Make sure to follow us on both to see if you've won. Great interview! I loved this book! I like the book trailer.